Try other fresh, frozen, or canned fruits. View all quantity recipes here: https://foodhero.org/quantity-recipes. In a medium bowl, mix oats, yogurt and milk. Add the fruit now or add just before eating. Cover and refrigerate oatmeal mixture for 6-12 hours. For grab-and-go breakfasts, place scoops of mixture in small dishes or spoon into small containers with lids. 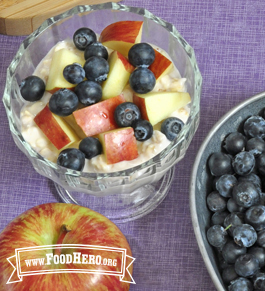 3 Comments for "Overnight Oatmeal"
This recipe goes great with Food Hero's Not Your Everyday Apples when the apples are prepared ahead of time and served cold as a topping for the oatmeal. This was yummy, but turned out a bit thick. Oatmeal is my favorite food for breakfast, so this is a good recipe for the hot summer-time! I use any fruit I have on hand.